Upon attempting to review Pharma Market Online Now, we were unable to get very far. Our computers are unable to view any of the page content, as the site is deemed an “exploit pharmacy spam site” through our anti-virus software. This alarming notice led us to investigate further into the possibility that the site was fraudulent and dangerous to customers. The site is dangerous enough at first glance to prohibit us from determining what types of medications they claim to sell, what their prices or shipping costs may be, or even what country they are located in. There are no customer reviews available for this site. If the site itself offers reviews or testimonials, we are unable to view them. There are no searchable third party reviews from customers on the internet either. We are able to find the report from trusted online pharmacy watchdog Legit Script, which names Pharma Market Online Now as a Rogue Internet Pharmacy. To be classified as a Rogue Pharmacy, a business must be illegal and dangerous for use. Often, the medications sold from these types of sites are not pure, or even remotely similar to the real prescriptions. Through their research, we discovered that the domain and IP for this site is located in Rostovskaya (Russia). 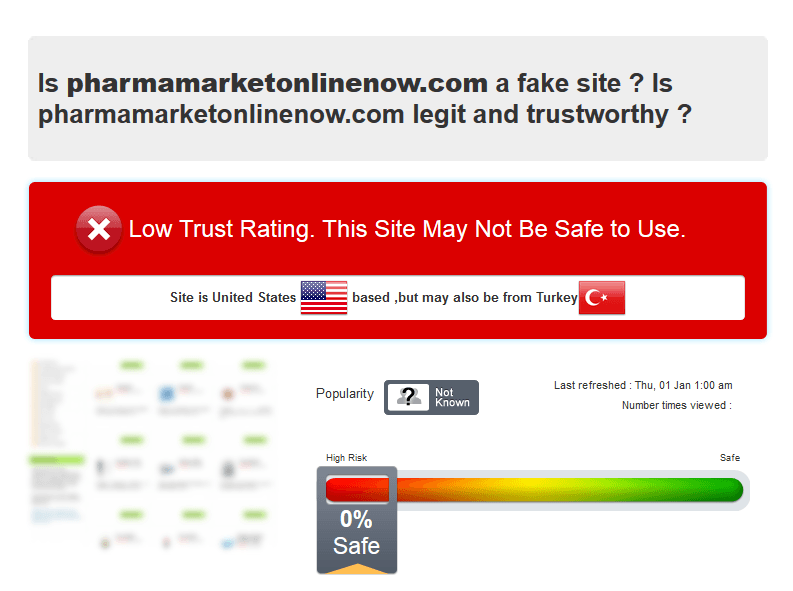 After further exploration, we found the Scam Advisor report for Pharma Market Online Now, which states the website has the lowest trust rating and may not be safe. Any site that claims to be based out of one country when it is actually located in another is dangerous to visit and purchase from. 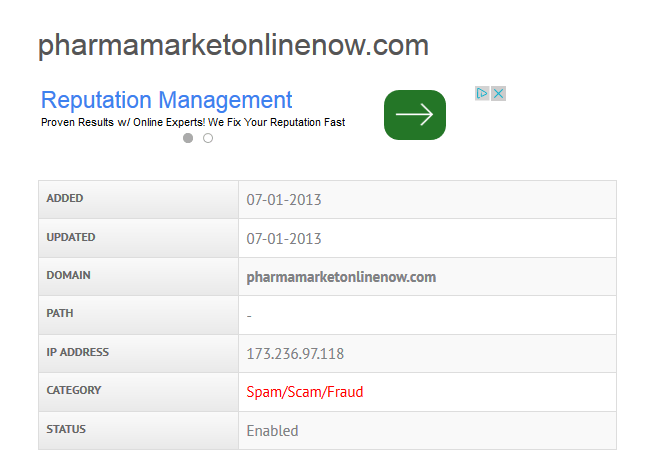 The Threat Log website lists Pharma Market Online Now as a Spam, Scam, and Fraud categorized website as well. There are no coupon codes for this website as the site is fraudulent. Due to the multiple threat reports and our own software threat detection, Pharma Market Online Now receives the lowest rating possible, 1 star out of 5. This site is proven to be a fraudulent and dangerous business. We would not recommend this site to anyone seeking to purchase legitimate prescription medications.